In the morning you will hear the birds, open your eyes, climb down from my knee, kiss me, tiptoe away and leave me far behind in a book, where we both fell asleep dreaming. So begins this whimsical celebration of the importance of living in the moment so that we get to fully experience all that life has to offer. The carefully chosen words are a reminder to all of us that every day we need to take time to touch the earth, stretch to the sky, plant that apple tree, meet friends, hop and skip along paths together and splash through puddles! 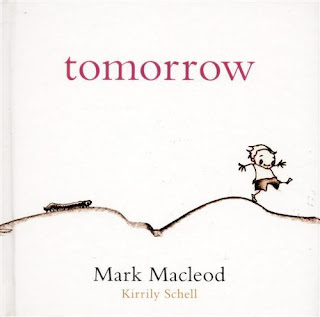 Along the way, we might encounter shadows or 'small shivering dogs' that will 'snap at our heels' but we can walk right on past, simply looking them in the eye and telling them we're off to 'find tomorrow'. Mark Macleod has perfectly captured the playfulness of a young child as they run and jump through their day, wobbling on walls, watching balloons soar through the sky and lying on the grass. He's also not afraid to play with stereotypes as we pass 'men folding sheets' and 'women quietly thinking'! And Kirrily Schell's simple line drawings are the ideal complement to what is a truly beautiful book that offers more with each reading. My daughter has loved listening to me read this since she was three. But the timeless message that 'tomorrow is today' and that we must seize the moment is one that people of all ages will appreciate.